The reputation of the author of “Twice-Told Tales” has been confined, until very lately, to literary society; and I have not been wrong, perhaps, in citing him as the example, par excellence, in this country, of the privately admired and publicly-unappreciated man of genius. Within the last year or two, it is true, an occasional critic has been urged, by honest indignation, into very warm approval. Mr. Webber, for instance (than whom no one has a keener relish for that kind of writing which Mr. Hawthorne has best illustrated), gave us, in a late number of The American Review, a cordial and certainly a full tribute to his talents; and since the issue of the “Mosses from an Old Manse” criticisms of similar tone have been by no means infrequent in our more authoritative journals. I can call to mind few reviews of Hawthorne published before the “Mosses.” One I remember in Arcturus (edited by Matthews and Duyckinck) for May, 1841; another in the American Monthly (edited by Hoffman and Herbert) for March, 1838; a third in the ninety-sixth number of The North American Review. These criticisms, however, seemed to have little effect on the popular taste—at least, if we are to form any idea of the popular taste by reference to its expression in the newspapers, or by the sale of the author’s book. It was never the fashion (until lately) to speak of him in any summary of our best authors…. Beyond doubt, this inappreciation of him on the part of the public arose chiefly from the two causes to which I have referred—from the facts that he is neither a man of wealth nor a quack; but these are insufficient to account for the whole effect. No small portion of it is attributable to the very marked idiosyncrasy of Mr. Hawthorne himself. In one sense, and in great measure, to be peculiar is to be original, and than the true originality there is no higher literary virtue. This true or commendable originality, however, implies not the uniform, but the continuous peculiarity—a peculiarity springing from ever-active vigor of fancy—better still if from ever-present force of imagination, giving its own hue, its own character to everything it touches, and, especially, self-impelled to touch everything…. The pieces in the volumes entitled “Twice-Told Tales” are now in their third republication, and, of course, are thrice-told. Moreover, they are by no means all tales, either in the ordinary or in the legitimate understanding of the term. Many of them are pure essays. Of the Essays I must be content to speak in brief. They are each and all beautiful, without being characterized by the polish and adaptation so visible in the tales proper. A painter would at once note their leading or predominant feature, and style it repose. There is no attempt at effect. All is quiet, thoughtful, subdued. Yet this repose may exist simultaneously with high originality of thought; and Mr. Hawthorne has demonstrated the fact. At every turn we meet with novel combinations; yet these combinations never surpass the limits of the quiet. We are soothed as we read; and withal is a calm astonishment that ideas so apparently obvious have never occurred or been presented to us before. Herein our author differs materially from Lamb or Hunt or Hazlitt—who, with vivid originality of manner and expression, have less of the true novelty of thought than is generally supposed, and whose originality, at best, has an uneasy and meretricious quaintness, replete with startling effects unfounded in nature, and inducing trains of reflection which lead to no satisfactory result. 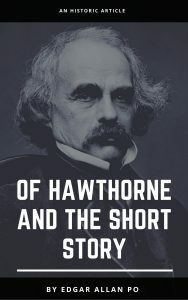 The essays of Hawthorne have much of the character of Irving, with more of originality, and less of finish; while, compared with the Spectator, they have a vast superiority at all points. The Spectator, Mr. Irving and Hawthorne have in common that tranquil and subdued manner which I have chosen to denominate repose; but, in the ease of the two former, this repose is attained rather by the absence of novel combination, or of originality, than otherwise, and consists chiefly in the calm, quiet, unostentatious expression of commonplace thoughts, in an unambitious, unadulterated Saxon. In them, by strong effort, we are made to conceive the absence of all. In the essays before me the absence of effort is too obvious to be mistaken, and a strong undercurrent of suggestion runs continuously beneath the upper stream of the tranquil thesis. In short, these effusions of Mr. Hawthorne are the product of a truly imaginative intellect, restrained, and in some measure represt by fastidiousness of taste, by constitutional melancholy, and by indolence. afforded by the wide domains of mere prose. Were I bidden to say how the highest genius could be most advantageously employed for the best display of its own powers, I should answer, without hesitation—in the composition of a rimed poem, not to exceed in length what might be perused in an hour. Within this limit alone can the highest order of true poetry exist. I need only here say, upon this topic, that, in almost all classes of composition, the unity of effect or impression is a point of the greatest importance. It is clear, moreover, that this unity can not be thoroughly preserved in productions whose perusal can not be completed at one sitting. We may continue the reading of a prose composition, from the very nature of prose itself, much longer than we can persevere, to any good purpose, in the perusal of a poem. This latter, if truly fulfilling the demands of the poetic sentiment, induces an exaltation of the soul which can not be long sustained. All high excitements are necessarily transient. Thus a long poem is a paradox. And, without unity of impression, the deepest effects can not be brought about. Epics were the offspring of an imperfect sense of art, and their reign is no more. A poem too brief may produce a vivid, but never an intense or enduring impression. Without a certain continuity of effort—without a certain duration or repetition of purpose—the soul is never deeply moved. There must be the dropping of the water upon the rock. De Béranger has wrought brilliant things—pungent and spirit-stirring—but, like all impassive bodies, they lack momentum, and thus fail to satisfy the poetic sentiment. They sparkle and excite, but, from want of continuity, fail deeply to impress. Extreme brevity will degenerate into epigrammatism; but the sin of extreme length is even more unpardonable. In medio tutissimus ibis. Were I called upon, however, to designate that class of composition which, next to such a poem as I have suggested, should best fulfil the demands of high genius—should offer it the most advantageous field of exertion—I should unhesitatingly speak of the prose tale, as Mr. Hawthorne has here exemplified it. I allude to the short prose narrative, requiring from a half-hour to one or two hours in its perusal. Of Mr. Hawthorne’s “Tales” we would say, emphatically that they belong to the highest region of art—an art subservient to genius of a very lofty order…. We know of few compositions which the critic can more honestly commend than these “Twice-Told Tales.” As Americans, we feel proud of the book. Mr. Hawthorne’s distinctive trait is invention, creation, imagination, originality—a trait which, in the literature of fiction, is positively worth all the rest. But the nature of the originality, so far as regards its manifestation in letters, is but imperfectly understood. The inventive or original mind as frequently displays itself in novelty of tone as in novelty of matter. Mr. Hawthorne is original in all points. It would be a matter of some difficulty to designate the best of these tales; we repeat that, without exception, they are beautiful. He has the purest style, the finest taste, the most available scholarship, the most delicate humor, the most touching pathos, the most radiant imagination, the most consummate ingenuity; and with these varied good qualities he has done well as a mystic. But is there any one of these qualities which should prevent his doing doubly as well in a career of honest, upright, sensible, prehensible and comprehensible things? Let him mend his pen, get a bottle of visible ink, come out from the “Old Manse,” cut Mr. Alcott, hang (if possible) the editor of The Dial, and throw out of the window to the pigs all his odd numbers of The North American Review.